Welcome to the website of study association Albion. Almost every degree at Utrecht University has its own study association, and for the degree of English Language and Culture this is Albion. As a study association, we do everything we can to help you get the most out of your time at Utrecht University. We organise all sorts of activities: from career events and symposia to parties and pub quizzes, but also trips to Ireland, Scotland or England. We are in close contact with the English Department and make sure your feedback reaches the right people. None of this is mandatory, every activity is organised for all members and you can simply join whenever you like. Do you want to know more about Albion and its activities? Check out our brand new brochure. You can join Albion if you study of have studied English Language and Culture at Utrecht University. Contribution is €10 annually, but for your first year there will be an additional €20 fee. Once you are a member you are more than welcome to join every activity Albion organises and you will receive discounts on your study books if you order them in our web shop. Click here to join Albion. Like the Albion Facebook page to keep yourself updated and entertained. It contains up-to-date information on all activities and events. You can also ask your quick questions there. And of course you can always reach us via albionutrecht@gmail.com. Albion Utrecht has been around since 1959; however, it ceased to exist at some point. It was refounded in 1991 as the study association we now know and love. “Originally there were two institutes: one for English Language and Literature and the other one for American Literature, co-located in adjacent buildings at the Maliebaan. Later on, when student numbers kept rising (at one time we enrolled 140 (!) first-year students) the Institute was moved to the Oudenoord. From there it was transferred to the Trans where it still resides, although in a diminished form, no longer a separate entity, but amalgamated into the Department of Languages, Literature and Communication. Far more interesting are the changes in the education programs. Nationally three main periods can be distinguished: kandidaats-doctoraal; twee-fasen structure and the modern Bachelor-Master. The kandidaats-doctoraal track which I followed took nominally 3 years for the kandidaats and two more years for the doctoraal, including teacher training. Actually – hard to believe nowadays – not many students finished in less than seven years, if they finished at all, because only about a third of the first-year students were awarded the doctoraal degree. When new full professors were appointed to the department the emphasis of study subjects was switched from knowledge to insight and the curriculum was tightened up resulting in far more students taking their kandidaats degree within the prescribed three year period. The new two phase structure (twee fasenstructuur) professionalized teacher training into a separate tract after a four year program (propedeuse one year and doctoraal three) but was swept away (and a good thing this proved to be) by the European move towards a Bachelor-Master curriculum with its wide range of specializations after the bachelor period. Much has changed in the program throughout the years and for the good, but some elements remain, such as the language laboratory, descriptive grammar and other first year programs which look alike to the ones we had to go through. Albion is the oldest (known) name of the island of Great Britain, and is today still used in poetry. 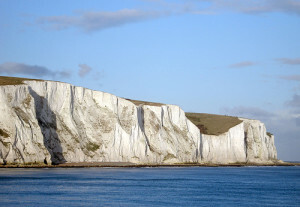 The white cliffs of Dover may have been the reason Great Britain was called Albion; as Albion means either white, or hill.